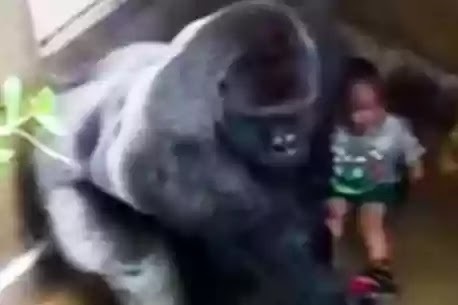 Police have been prompted by public pressure as they begin probe into whether the parents of boy Isaiah Dickerson who fell into gorilla enclosure at the Cincinnati zoo should be charged for criminal neglect. Isaiah Dickerson's parents could face criminal charges after more than one million people took to social media to condemn both parents who's son Isaiah fell into "Harambe" the gorilla's enclosure at the Cincinnati zoo. Harambe, an endangered silver backed gorilla was shot dead by zoo officials after the boy fell into its enclosure. But he was called "gentle giant"
Video footages showing the gorilla protecting the boy before being shot dead has sparked public outrage. The tragic shooting of the Harambe the gorilla, has been labelled as murder by the angry public who are calling for justice against the boy's parents as well as the Cincinnati zoo. 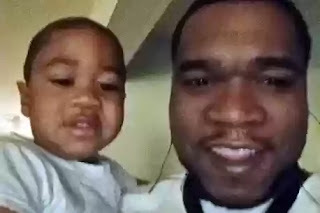 Four year old Isaiah's father Deonne Dickerson' and his girlfriend Michelle Gregg are presently being investigated for child neglect. This comes after eyewitnesses who saw the boy fall in, claimed that Michelle Greg was not even immediately aware that it was her boy that fell into the gorilla enclosure. Since the incident more than 350,000 people around the world have signed a petition called 'Justice for Harambe"
During investigations, it was revealed that the boys father Deonne Dickerson is no stranger to criminal activity. Over the course of a decade, the 36 year old has been in trouble with the law for crimes ranging from burglary, firearm possession, criminal trespass and even kidnapping. But friends close to the family have said that Deonne has since turned his life around. Both parents have defended their actions and are prepared to fight the charges.